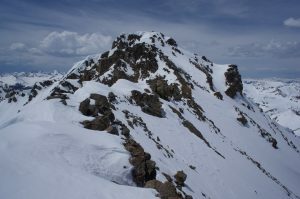 These two high 13ers are buried at the head of Half Moon Creek, west of Mount Massive and northeast of Independence Pass. Deer, the more interesting of the two, is slightly lower, falling short of being among Colorado’s highest 100 by 40′. 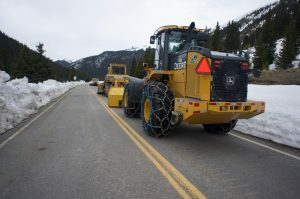 In the summer, they are normally approached via Half Moon Creek from the east, but with that road impassable far below the summer trailhead, they are best reached from the road to Independence Pass. This plowed and dry road was spitefully gated well short of the trailhead, but the mile or two of road walking in either direction was tolerable. I woke up at my campsite at the gate at 5:30, but was slow to get started, not hitting the road until about 6:20. 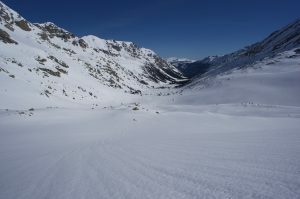 Since the day involved much road and not much difficult terrain, I packed light, with only running shoes and snowshoes. I passed some road-clearing equipment, then left the road at the big bend to continue north up Lake Creek. To my surprise and pleasure, the snow was hard enough that I didn’t even need snowshoes as I made my way toward the Continental Divide. I finally put the snowshoes on below Lake 12,378′, not because I was sinking in, but because I needed more traction. My 10-year-old MSR Lightnings are starting to fall apart, but they still have enough teeth to act as pseudo-crampons. Lake 12,378′, nestled just below the Divide, was of course completely frozen and covered, but I went around it out of excess caution, then finally got my first view of Oklahoma, on the east side of a clear U-shaped glacial valley, somewhat unusual for Colorado. I dropped partway down the north side of the pass, then did a long, miserable sidehill before climbing to the 12,800′ tundra plateau between Oklahoma and Deer. I briefly harassed a ptarmigan here, then headed north up the long, gradual ridge to Oklahoma. There were enough exposed rocks to keep my snowshoes strapped to my pack with only minimal postholing. With the higher and aptly-named Massive only a short saddle away, Oklahoma is a thoroughly underwhelming peak. I mentally ticked it off, had a snack, then retraced my route to the tundra plain. Despite being northeast-facing, most of the ridge to Deer was snow-free and almost dry. The final steep pitch to the false summit, however, was covered in unstable slush, and it was a desperate slog. I put on snowshoes for this part, then had to take them off again only a few minutes later to deal with the final class 3 scramble to the summit. I found my first register of the summer here, and it was even dry (! ), so I signed in, then plotted my path home. After following the ridge south a bit, I made a careful glissade down Deer’s north face, then plodded back to my outward path near Lake Creek. Then it was just wet slush and dry road to the car.